Our experienced team of specialists will help you reach your wholesale coffee goals as we design a wholesale program together. For more information, please either complete this wholesale inquiry form or call us at (877) 537-3642. Are you considering opening a café or restaurant or making a change to improve the quality of the fresh brewed coffee and espresso drinks that you serve? Jeremiah’s Pick wholesale food & beverage coffee program features gourmet coffees, both conventional and organic, competitive pricing, training and our experienced food service staff. Our wholesale food service program is featured at cafes and restaurants throughout the country. A wide variety of coffees, all of which are 100% Arabica and artisan roasted. Many of our gourmet coffees are unique and all are roasted carefully to bring out their character. One-stop shopping including cups, syrups, espresso accessories, sugar and sweeteners. Depending upon location, training can be held on site and includes manuals and all of the recipes that you need to make great espresso drinks. We supply equipment depending upon location and volumes and assist you with sourcing the right equipment for your restaurant or café. Call us to learn more about these options. Coffee is delivered by Federal Express with no extra charge on orders over $300.00. Same day shipping on orders placed before 12:00 Noon, Pacific Time. It was his long love affair with coffee that led Jeremiah Pick to the wholesale specialty coffee business over 20 years ago. He is widely known as an industry pioneer; the first visionary to bring gourmet coffee to the specialty grocery aisle. Since then our company has created the finest coffees and wholesale programs available in natural and specialty food stores throughout the country. Put simply, we know and live grocery. Jeremiah’s Pick is dedicated to providing successful programs to specialty and natural groceries, the businesses that we serve. We custom build beautiful cabinetry to house our coffee program. Then we support our products with effective signage; in-store tasting both active and passive, regular promotions and innovative cross merchandizing concepts. Ask about our hot coffee programs for grocery stores, simple and effective and best of all, a full time tasting for our coffees and your customers. What sets our gourmet coffees apart? A simple concept: “Right Roast. Right Taste”. Starting with the finest green coffee beans, selected by Jeremiah, each batch is hand-roasted and married carefully to the right color profile to highlight the nuances of each coffee’s origin and varying character. The design of our whole drum roaster insures that no flame ever contacts the beans during roasting, creating consistent and superior flavor profiles. And the result? Coffee that is always delicious and never bitter. Are your customers concerned about where their coffees come from? We work with socially and environmentally responsible family farms and cooperatives and visit them regularly. By establishing long-term relationships for the supply of exceptional green beans at prices that support investments in land and people, we insure quality, consistency and integrity. We act as your wholesale gourmet coffee category manager, making sure that your coffee program is always first class and cutting edge. Please call us at (877) 537-3642 or complete a wholesale inquiry form so that we can learn more about your store, your goals and build a great wholesale coffee program for you and your customers. What sets Jeremiah Pick Coffee’s private label program apart is not only the exceptional quality and selection of our coffee, but our ability to customize the program around your exact needs. Our large selection of conventional, flavored, decaffeinated, and organic coffees provides the unique opportunity for you to put together an assortment that you and your customers will respond to. We roast to order! This means that your coffee is packaged and shipped within 48 hours of roasting ensuring that your coffee is always fresh. We also offer smaller minimum orders as well as free shipping on orders over $300 to help you keep your inventory fresh and your customers happy. We do not offer drop shipping but we will be glad to send it to your place of business and you will be able to handle all distribution of your product. A private label program gives you the distinct advantage of furthering your brand and creating your niche within your market. Whether you are a new or established café, a grocery store, a company that sells coffee over the internet, or even a business looking to use a unique product in your marketing campaign or as a corporate gift, we will work with you to build the private label program you are striving for. Step 1. Selecting your coffee(s). Along with your tastes and interests, also consider your customer base when selecting your coffee. Are your customers open to unique and innovative coffees or are they more traditional and prefer a French Roast or a Breakfast Blend? We recommend sampling a range of Jeremiah’s Pick coffee from light to medium roasts in order to find your right roast right taste. We feel the best labels are ones that focus on representing the brand as well as catching the attention of the customer base. When you know which products and ideas you would like to market, you will need to design and print your own labels. We would be happy to recommend a printing company to you that fits your budget and project. You may choose to send the labels to us so that we may properly package it for you. Note: Organic product labels involve specific requirements and you will need to get it approved by CCOF or any organic certification organization. Step 3. Choosing your packaging. We offer you an assortment of valve bags that are available for 10, 12 and 16 oz sizes and in an assortment of colors. If you prefer a different type of packaging that we do not carry in stock, you will also need to provide us with your packaging as well. Step 4. Selling your coffee. We are here to help make your private label coffee program a success. If you need assistance with coffee descriptions, pricing, coffee knowledge, cross merchandising ideas or general marketing ideas let us know. If you have a gift basket business and are looking for something to really jazz it up, look no further. Our gourmet coffees and products indulge all of your senses, making the perfect gift basket items. We are proud and excited to share with you some of our most visually exciting and taste bud tantalizing coffees, perfect and essential to any fabulous gift basket. Coffee is the perfect addition to many different gift basket themes. At Jeremiah’s Pick, we offer a variety of coffees, both colorful and unique that could be exactly what you’ve been searching for. These gourmet treats are not only delicious, but aesthetically make for a lavish and exciting gift. Our coffees come in the perfect size to be nuzzled into a basket. We carry 10 oz and some 16 oz bags for any deluxe gift basket. As you will see Jeremiah’s Pick is a perfect fit for your booming gift basket business. Are you considering opening a green café or restaurant or making a change to improve the quality of the fresh brewed organic coffee and espresso drinks that you serve? Jeremiah’s Pick wholesale food & beverage coffee program features organic coffees, competitive pricing, training and our experienced food service staff. Our wholesale organic food service program is featured at green cafes and restaurants throughout the country. Jeremiah’s Pick organic wholesale food service program features. A wide variety of coffees, all of which are 100% Arabica and artisan roasted. Many of our gourmet coffees are unique and all are roasted carefully to bring out their character. All are certified by CCOF and are Kosher. One stop shopping including cups, syrups, espresso accessories, sugar and sweeteners. Depending upon location training can be held on site and includes manuals and all of the recipes that you need to make great espresso drinks. Excellent customer service. Same day shipping on orders placed before 12 pacific time. Coffee is an ideal product to help your organization raise the money it needs. We have carefully selected an assortment of coffees that are ideal for supporting your fundraising efforts. These artisan roasted coffees are packaged in up to full pound bags and vacuum sealed to assure freshness. With a shelf life of six months and a price that allows for a profitable return and a reasonable sell price; these coffees are sure to be a winner. For larger projects you might consider offering private label coffees. To learn more about Jeremiah’s Pick Coffee’s fundraising program, please fill out a wholesale inquiry or call us toll-free at (877) 537-3642. 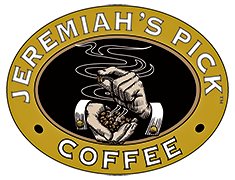 Jeremiah’s Pick Coffee Roasting Co.
Jeremiah’s Pick Coffee Co. welcomes your comments, suggestions, and questions. If you need to get in touch with us, you can contact us by phone, fax, email or old-fashioned mail.